Tow Up To 6,000 LBS. When you drive around the Greeneville, TN area inside your new 2019 Nissan Pathfinder, you’re in an SUV that takes the adventure to the next level. The New Pathfinder comes with an impressive towing capacity that reaches up to 6,000 pounds and an available intelligent 4-wheel drive system designed to handle the terrain in any weather. 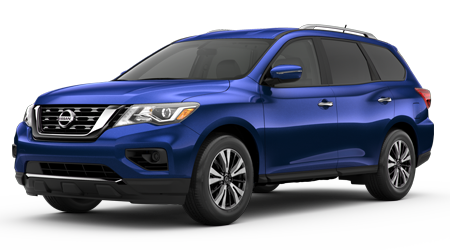 Plus, when you add in the extra cargo space, driving the family on a road trip is easy this year within the new 2019 Nissan Pathfinder. Visit our Wallace Nissan of Kingsport dealership and schedule a test drive of the new 2019 Nissan Pathfinder. Our new and used Nissan dealership services all drivers in the Kingsport and Elizabethton, TN areas. When you visit with us at Wallace Nissan, you get to work with highly trained Nissan experts to find the right sedan, truck or SUV to meet your needs. You also get to work with our top of the line finance team. Fill out a credit application on our website to find the most competitive auto loans available in your area. Our goal is to make the car buying process as easy and comfortable as possible. And comfort is an easy goal to attain inside the new 2019 Nissan Pathfinder with an available Tri-Zone Climate Control System and the available Climate-Controlled Front Seats. Now, your SUV will greet you with a heated steering wheel and warm seats on those chilly mornings. We at Wallace Nissan understand how critical the maintenance of your SUV is to the safety of you and your family. That’s why we have the on-site Vehicle Service Team to help you. Our service team is highly trained to handle any maintenance issue when it comes to the wellbeing of your new or used Nissan SUV, truck or sedan. Meet with our service team to learn how simple vehicle maintenance like an oil change can help keep your family safe. Visit us today and start finding your path!